Our emphasis on quality and range development has resulted in a range sourced from across the globe. All parts are provided by OEM or BER compliant aftermarket suppliers, all with a long history of supplying parts into the European aftermarket. All parts conform to the latest TS 16949, ISO 9001 and ISO 14001 standards and are tested thoroughly to ensure that the product in the box is of the highest quality. In some instances parts will even be tested twice – post production and prior to being dispatched. Parts that go through this specific testing process will feature a quality sticker, showing customers that the part has undergone a rigorous testing process. All Cambiare products are covered by a two year or 30,000 mile warranty - whichever comes first. The warranty commences on the date of installation of the component. This warranty only protects against faults caused by manufacturing or material defects. It does not cover failure through general “wear and tear”. This warranty only applies to parts correctly selected by application from the current Cambiare catalogue and which are fitted according to the vehicle manufacturer’s specification and service schedules. This warranty is limited to the replacement of the faulty parts and does not cover faults arising from incorrect installation, misuse, neglect or accident. Cambiare reserves the right to reject any claim where the part has been fitted to a vehicle that has been used for motor sport, track days or any other off-highway activity. All claims must be made to Cambiare, or their appointed representative within that country, in writing, with full details of the fault and vehicle as soon as it is discovered, together with a copy of the original purchase documentation and also any sale documentation. An inspection of the product and of the vehicle in question may be necessary to substantiate a claim. Cambiare shall not be liable for consequential loss or incidental damages resulting from or raised by the use, operation, failure, malfunction or defect of any Cambiare product. If you have a warranty query, please contact our technical helpline on 0845 543 8280. There are two EGR valves catalogued for a variety of Toyota Auris/Avensis/Corolla 2.2. diesel models. We have published a technical bulletin to help you choose the correct one. Tightened restrictions on vehicle emission control has resulted in the introduction of the EGR Valve with Cooler in modern vehicles. By listening and responding to customers quickly, our first to market approach has enabled us to become one of the leading vehicle electronics suppliers in the UK aftermarket. With the amount of parts controlled by the OBD and ECU continues to grow, so does our product offering. We are constantly striving to ensure that Cambiare is your one stop solution for all of your vehicle electronics requirements. So make sure you visit the site on a regular basis to keep up-to-date with the latest developments! If you are interested in becoming a distributor of Cambiare then we want to hear from you! Simply fill in the form to the right and one of our dedicated team will be in contact. All information will be treated as confidential and solely used for the purpose of determining how we may best service your requirements. WIN a Cambiare branded van! 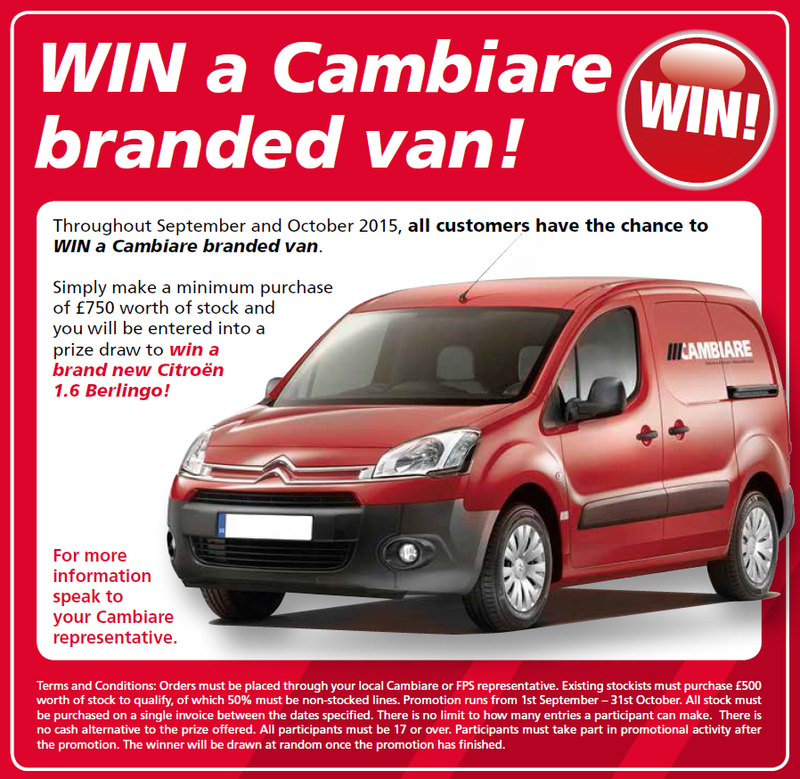 Throughout September and October 2015, all customers have the chance to WIN a Cambiare branded van. Simply make a minimum purchase of £750 worth of Cambiare stock and you will be entered into a prize draw to win a brand new Citroën 1.6 Berlingo! You must also select one of the fields marked with a #. Find the relevant part from our extensive range catalogue. Vehicle electronics specialist Cambiare is constantly adding new parts to range to meet aftermarket needs. Congratulations to Milehams of the A1 factor group who were the lucky winners of the Cambiare 2015 van promotion. The prize van, a brand new Cambiare branded Citroen Berlingo ,was presented by Cambiare Business Development Manager Richie Ley. Find your nearest local stockist using our Map search facility.